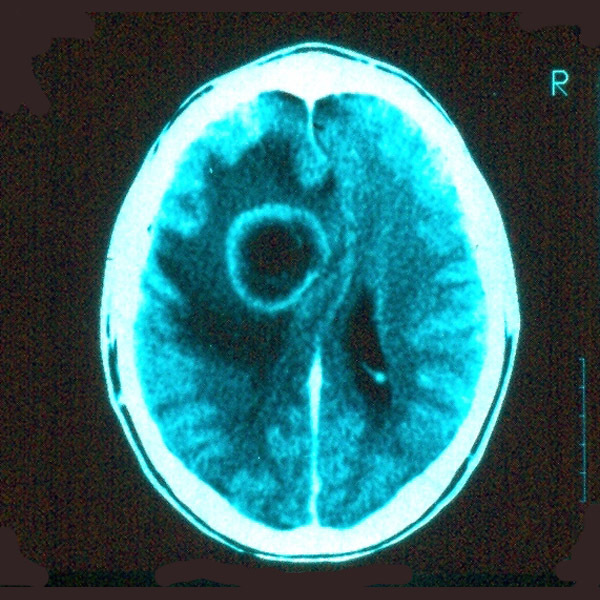 Nonspecific symptoms: Infection with E. granulosus should be included in the differential diagnosis for nonspecific neurological symptoms such as progressive headache, especially in children from the regions in which such parasitic diseases are endemic When a liver or lung cyst is discovered during the evaluation of a child, a cerebral cyst should be suspected (24). Key in the laboratory evaluation of a patient felt to possibly have an infestation by the echinococcal tapeworm is testing for immunological signs of exposure. These tests are used to confirm a clinical suspicion initially formed by radiographic imaging. Since the brain is immunologically privileged, these tests may be minimally responsive. CBC: Eosinophilia may be present on the peripheral smear. In the diagnosis of hydatid cysts, serological tests including indirect hemagglutination and latex agglutination, if positive, may be helpful. ELISA >92% positive: ELISA tests for the presence of echinococcal antigens. The ELISA is the most accurate test, having a >92% accuracy. It is the preferred serological test (56, 57). Casoni skin antigen test: The Casoni skin antigen test is positive 40–60% of the time in patients with a hydatid cyst (56, 57). Latex agglutination test: Latex balls coated with antibodies are exposed to serum. If the serum contains echinococcal antigens, the balls will stick to one another. Weinberg and Latex hemagglutination tests: These tests may give highly negative false rates and are not reliable diagnostic criteria for hydatid cyst (58, 59, 60). Post-treatment testing: After surgical resection, serological tests may be beneficial to determine the presence of residual or recurrent hydatid cyst (13, 35, 47). In addition to helping with surgical planning, the CT scan and MRI have tremendously increased diagnostic specificity (13,47). In most cases imaging will lead to a provisional diagnosis for a hydatid cyst by its characteristic appearance. The suspected diagnosis can then be confirmed serologically or by either careful aspiration or removal of the cyst. Differs from other cystic lesions: The diagnosis differs from that of other cystic lesions, including other cystic parasites, brain abscess, cystic astrocytoma, arachnoid cyst, porencephalic cyst, and benign neuroepithelial cyst. Abscesses and tumors tend to have rim enhancement and perilesional edema. 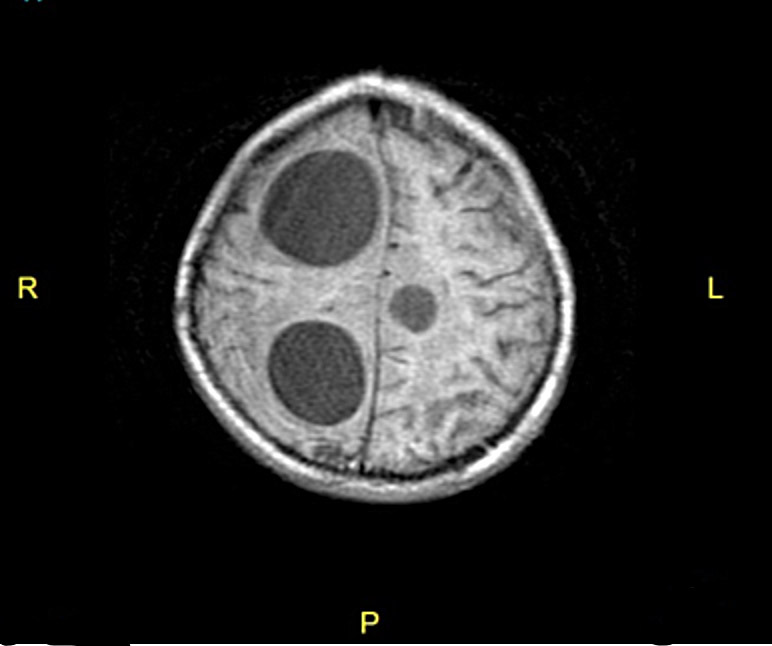 Arachnoid cyst, porencephalic cyst, and other neuroepithelial cysts are rarely spherical, and none are entirely surrounded by brain tissue (12, 28). 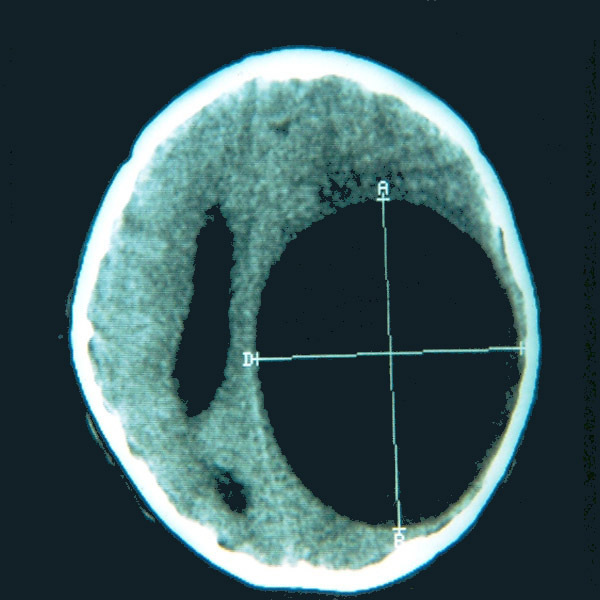 Round, CSF density cyst: On CT, cerebral hydatid cysts are round and well defined with no perilesional edema and a sharply defined border. The content of the cyst has an absorption value similar to that of CSF with no perilesional edema. 20–40% of lesions have a calcified cyst wall (1, 8,14, 15, 17, 22, 36, 38, 49). CT best for bone lesions: CT scans are more effective for diagnosis and follow up of cysts in bone (30). CSF density of cyst in brain with hypodense halo: MRI is superior to CT in diagnosis and is helpful in planning surgery. Hydatid cysts appear as spherical lesions with a hypointense halo around the cyst capsule. The cyst fluid generally has the same intensity as CSF, and there is no perilesional edema. No rim enhancement is detected after gadolinium infusion. Cyst scolices appear more hyperintense on T2-weighted imaging, whereas small vesicles and daughter cysts are visible in a cluster pattern. With the advance of new technologies, the characteristic features of in vivo proton MR spectroscopy in intracranial hydatid cysts are well-described (1, 10, 17, 22, 23, 26, 28, 35, 49). Features of MRI scan of spine not described: Although a spinal hydatid cyst is very well defined on neuroimages, there are no reports in the literature in which the neuroimaging properties of an infection secondary to spinal hydatidosis are defined (1, 10, 17, 22, 23, 26, 28, 35, 49).